Remember me mentioning a side project that threw me off during my 30 Queries in 30 Days project? Well, it’s now complete! I suspected even then that turning such a massive project — containing dozens of pictures — into a PDF would be a time-consuming affair. But I liked the idea, so I offered it and got a handful of takers. Instead of just cutting and pasting the previously written material, I made corrections and added some new information, as well as adding on some never-before-published skits and some of my post-MPS writings. Then I happened upon the news that PDFs are less than ideal for many uses nowadays. Because they don’t scale well, they are irritating for anyone reading them on a small screen (such as a smart phone or iPad). That’s when I decided to do a Kindle version, as well. Having done Kindle versions of my poetry book and my essays book (both available through the Alyce Wilson store), I didn’t think it would be too difficult, but neither of those had included photos (though the essay book did involve a number of footnotes). The Kindle project ate up a lot of time, as I painstakingly converted the existing PDF document into a HTML document which would then be converted by Kindle Direct Publishing into a Kindle book. Since this also involved resizing all of the photos, I also took the opportunity to use my newfound Adobe PhotoShop Elements skills to “retouch” them, fixing the color balance and reducing noise. When I’d finally entered the testing phase, I realized that the pictures rendered fairly small. While someone reading a PDF could zoom in on any photo to read the text, that was not an option for the reader using a Kindle device or the Kindle app. Therefore, I made one more pass on the document, providing physical descriptions of the photos that involved text and/or including the text in the body of the book. All told, the finished project clocked in at roughly 398 pages, which is a suitably silly number. I’ve dubbed it the “Executive Version” of the history, and you can purchase it from Kindle or order it from me as a PDF (use the “Buy it Now” button on the index page of the original project). 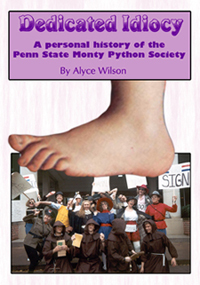 A wildly colorful look at the silly, anarchic history of the Penn State Monty Python Society from 1988-1993, packed with photos, funny stories and original sketches. From staging wacky events on the college campus to author Alyce Wilson’s personal interactions with some members of Monty Python, “Dedicated Idiocy” tells a universal story of friendship, played out on the always unpredictable stage of a college campus. If you love British humor, silliness, performance art, sketches and wacky stories about pranks, you will love “Dedicated Idiocy.” Tell all your friends! Coconuts not accepted as payment.